"Roselyn loved her flowers. Beautiful!" "Very easy to order online. Beautiful flowers." "The flowers were absolutely beautiful! They were delivered on time and even put out on the tables before I arrived to the event. Thank you so much!!" "These roses were beautiful and were delivered promptly.The stem quality was terrific and they lasted a long time. I will be ordering with you again..."
"It was a pleasure to have a deal with you)"
"LOVE LOVE LOVE being able to see what I ordered and LOVE the excellent service you always provide! Thank you a million! By far the best florist in town!" "Looks amazing as always !! Very reliable !" "Thank you so much! I appreciate it"
"Beautiful bouquet! Thank you for your fast and friendly service!" "Beautiful arrangement! My mom loved her flowers." "Looks good. I was hoping to see a few more flower"
"The floral arrangement you made for our dear friend, Stefan, were absolutely beautiful. When we saw the picture you sent us we were dismayed that the ribbon had the wrong wording on it and called to let you know. Salvy said "no problem" and took care of bringing a new ribbon to the funeral home. We are very appreciative of the commitment you have towards your customers. Thank you for everything. 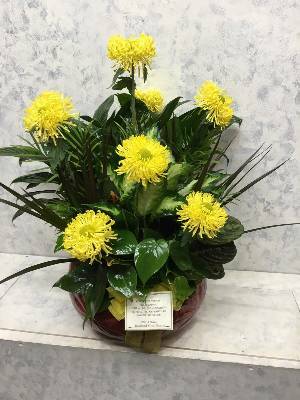 The LoCiceros"
"So happy with the arrangement that you created for my uncle�s funeral. It was different than all the others at the funeral home. Thanks for making a difficult time easier." "Tim, Thank you for visiting my shop. Your techniques on helping build my business are valuable. Having been in the flower business all of my life, your presentation has made it clear to me that you are never too old to listen and learn. We look forward to implementing your strategies to help move our business grow and compete at a higher level. I highly recommend that florists of any size, any where, take advantage of what you offer." "What a wonderful arrangement The salesperson was very helpful. " "they are beautiful thank you"
"I Appreciate the Beautiful rearrangements for my mom"
"The recipients loved them and i loved getting to see what i sent, a genius idea if you're ordering online and from a different city or state!!" "These flowers are very disappointing!! For $70.00 they should have looked far better than this! I can arrange flowers much better than this! There were suppose to be 12 roses with babies breath! How do you stay in business? You need help! Never again will i use your business! If you appreciated my business you would do a better job!" "It was nice but small for $300." "Looks good, but could have had more in the center. " "Beautiful arrangement, easy to order, and great service." "The arrangement is still blooming. Very well done as it pertains to giving lasting good feeling." "Very satisfied with deliveries to our employees. Receive positive comments from employees. Excellent staff!!!" "The arrangement was gorgeous! We are always very pleaded"
Do you want to see a photo of the arrangement you send? If the florist you use is not listed on our best floral reviews site, call them or send them an email telling them you'd like them to try the See What You Send™ mobile app for florists.